The cherry world re-opens its doors unveiling an enhanced version of itself. Last night for its opening, Pacha was lit up in red. Like the heart of the island beating once again, the super-club welcomed everyone open arms for the first of its six opening parties aptly named The Heartbeat Of The Island. It also revealed the result of its most significant renovation ever. After being closed over the winter for the first time in its history, Pacha Ibiza re-opened its doors. While we missed it during the colder months, the outcome was totally worth the wait. Ibiza's original and first super-club got a complete make-over that exceeded all expectations. When you first enter the main gate, everything looks the same: the walls of the original building, the picture of the initial finca, a typical Ibizan farmhouse, on the right of the entrance and even the plaque with the year of establishment, 1973, hanging above the double doors. You would almost think nothing had changed. Don't be fooled. Once you enter, it's a whole other world even while somehow remaining the same. Behind those doors, a round glass window with the Pacha cherries offers a glimpse of what awaits. On the right, two more doors lead into the reimagined cherry world. If you have been to Pacha in peak season, you will recall the Global Room, the room immediately on your right. The entirely new double-door entrance and three steps up lead into what used to be that room, but now it has become one with the old entrance walkway area turning it into a substantially large space. Bars line the white walls adding to the spacious and bright yet cavernous look embellished by iconic Pacha images and memorabilia decorating the vast room. This change makes that first impact inviting and welcoming. This first open-space room is connected with the main room. Three steps down and you are on the dance floor. Most importantly, upon entering, you immediately see the rest of the club, the DJ booth and the lights on the dancefloor, as well as hear the music. That puts you right in the middle of the action from the start. The energy is infectious. Speaking of DJ booth, it rises in the centre of the nightclub, between the VIP and the dance floor. While it used to be positioned there for Solomun, it is now much larger and an entity onto itself, the heart of the super-club every night of the week. As the architect, Juli Capella explained during the press conference, "the spirit of the times called for a repositioning of the DJ, now a protagonist compared to the 70s and 80s when it was in a dark corner. It is moved to the centre so the DJ can interact and have access to everyone." Last night, for the first of the six opening parties, a giant disco ball hung above the booth, the ultimate symbol of the 1970s, the era in which Pacha came to be. While it might not be there every night, it fit perfectly on the first of the six opening parties. With the expanded room and the new DJ booth at the heart of the super-club, the dance floor experience is massively improved. As much as we loved Pacha in its former incarnation, that dance floor was simply not large enough to contain the number of clubbers dancing. While the venue's capacity remains unchanged, the capacity of the dance floor has grown exponentially. This enhancement allows the DJ and the dancing crowd to become the focus of the club rather than the VIP area. Bravo! Even though the VIP area remains prominent and similar to how it used to be, it has also undergone a levelling out of sorts. Having the DJ booth raised above both areas and facing the dance floor, where the real dancing happens, equals out the two. Also, all superfluous structures have been removed, making the stone walls lining the back of the VIP area visible thus adding to the original look of the finca. Adding to this, upstairs both the VIP and the non-VIP areas all have a full view of the nightclub, dance floor and DJ booth. The whole space extends that feeling of openness. While earlier there were admittedly many dead spots, now from every part of Pacha you can see the club in its entirety. Another remarkable change is the entire infrastructure of the club. The ceiling is completely new, a proper ceiling adding space and making room for the cutting-edge lights, production toys and an invigorated d&b audio technic system - all next generation. Overall, the whole space looks airier, brighter, bringing to the fore the white walls and lines of the original finca. The floors are a very light whitewashed wood, with a vintage feel yet of the finest materials. One change some might be sad about, at least at first, is that the Funky Room has gone. It has to be said, though, that the room in recent years simply did not get consistently busy. Often serving more as a passageway from the upstairs terrace than anything else, the vibe of its earlier days did not hold up. The good news is that a second dance floor remains, finding a new home in the Pachacha room. For those of you who missed it, that room is immediately on the left when entering Pacha from the main gates, before the actual building. This room fits around 300 people and has dark wooden floors, sofas in the back and an overall really cosy and intimate feel. The bathrooms have also all been completely refurbished, each in a different style. The ones on the far right are inspired by travel, appearing like a shipping box with various destinations. The ones on the left are inspired by the beauty of Ibiza, with each stall entirely covered in a giant image of an Ibiza beach, sunset or iconic Ibiza spot. The VIP bathrooms deserve special mention, with each cardinal sin represented on the door. The one representing lust even has two toilets. Naughty naughty. Perhaps the most impressive - and quite frankly reassuring factor - is that all these changes were made while totally respecting and maintaining the original feel of Pacha. As we know, the club was born out of an authentic Ibizan finca. Architect Juli Capella pumped new life into that original structure while subtly decking it out with massive improvements. Now that we have finally been let into the venue, we can say that the refurbishment has built on the club's strengths, retaining its soul and amplifying its essence. It is still Pacha, still Ibiza. The difference is that Pacha now has the feel of a modern super-club while retaining that class, charm and traditional poise that have always distinguished it. If anything, the renovation has recovered and polished this natural beauty. As Hot Since 82 got on the decks, the queues were spilling onto the street, snaking around the corner. 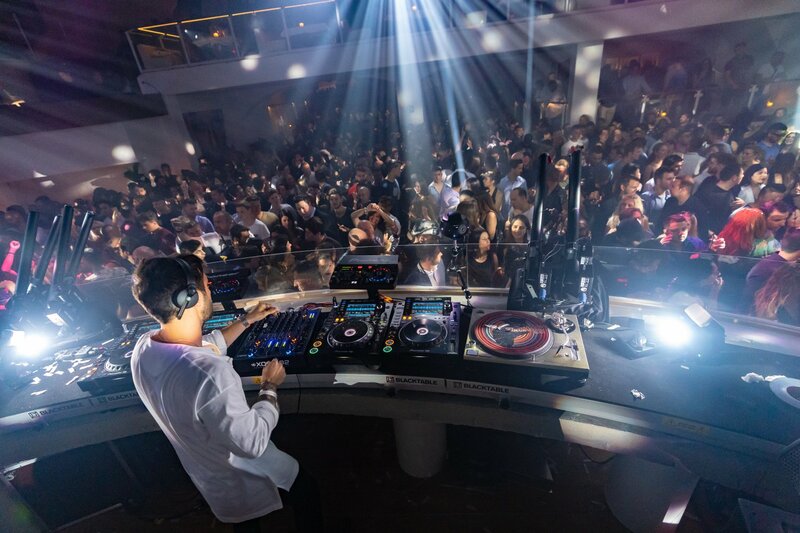 Over the course of the night, more than 5,000 people showed up to welcome the new Pacha, for its first-ever opening. The club has always remained open during the winter and will go back to doing so, as the original Ibicenco club. Judging from the crowd, you would have thought it summer already and not the first days of May. Everyone wanted to have a peek and with good reason. We suggest you do, too. Mark our words.